I’ve seen the future of messaging — it looks a lot like Facebook Messages. More specifically, it looks like the new version of Facebook Messages that the company began rolling out two weeks ago. But I’m not sure that the future is Facebook Messages. At least not for me. Because that’s simply not how I have used Facebook and it’s too hard to switch my patterns now. And that’s why Gmail has a huge opportunity. We need a Gmail Lite. At first, I was underwhelmed by the new Facebook Messages. But that’s just because I really hadn’t been using Facebook Messages before. I would get a message every now and then, but mostly I would ignore the area. But in the past couple of weeks, probably as the feature gets turned on for more users, I’ve started to get more messages coming to me this way. And as that has happened, I’m seeing the absolute beauty of the system. Namely, I’m seeing the beauty in its speed. I’m not even talking about loading times or anything necessarily related to the technology behind Facebook Messages. What I’m talking about is the feature that allows you to respond to a message simply by typing in the tiny box below it and hitting return to send. Some people hate this idea because they want the return button to insert a carriage return like the old days — and that’s fine, that’s still an option right next to the box you’re typing in — but I love this quick-send ability. Love. Love. Love it. The famous cliche is that every second counts. But it’s a cliche because it’s true. Every second does count. At first, you might think it’s ridiculous that I’m jumping for joy because Facebook Messages is saving me one or two seconds by not having to use the send button. But those seconds really do add up. I wonder how many times over the years I’ve hit that send button? Tens of thousands? Hundreds of thousands? 100,000 seconds is almost 28 hours. In other words, I’ve probably wasted a day of my life hitting that stupid button. And yes, I know there are keyboard shortcuts. But the percentage of people who use those is likely pretty small. Plus, on Gmail, the keyboard shortcut to send something involves hitting two keys: tab then enter. If you could cut out the tab part, you’d still be saving about a half second. Again, per message. It adds up. But that’s just one part of it. Let’s talk more specifically about Gmail. The product I’m envisioning would be an opt-in version of the service which would replace the standard Gmail that we all know and love (when it’s not unbearably slow these days) with a modified version. This new version would work much like Facebook Messages in that when you load a message thread, you’d have a small box under it: the reply area. To reply, you’d simply type a message and hit return, and off it would go. There would be no options to change the fonts of the email. No subject line. No CC field, no BCC field. No left-align, right-align, quotes, bullet lists, etc. None of the crap that you don’t use 99 percent of the time. It would just be a tiny input box that you could type a message into, or paste a URL into. Ideally, you’d be able to drag a photo or document in this box too, to attach it to the message (like you now can with regular Gmail). And then you send it. Again, just like Facebook Messages. If for some reason you needed to add any of the above mentioned clutter to your message, there would be a button to make that stuff appear. But by default, it would all be off. It would just be a small input box. But the real key to this Gmail Lite that I envision would be a restriction. Message length. Currently, a huge amount of time with email is wasted trying to fit it into some lame formal style. Thank you so much for the such and such. It was great to so and so. Hopefully we can such and such again. Oh and blah blah blah. Wasn’t that blah? P.S. Writing this sentence just wasted another 20 seconds of my time. If you want to be formal with someone, send them a letter. 99 percent of messages online should be brief. That’s it. If anyone wonders why SMS has been exploding in usage over the past decade (in spite of rip-off costs), this is it. There’s no reason email shouldn’t work like that as well. And while email may be getting less formal with time, I would bet that the length of the emails actually isn’t going down. That’s why we need a new restriction in place in this Gmail Lite to enforce that. Back in September, my colleague Jon wrote about the awesome movement to send three sentence emails. It’s a wonderful idea, but it’s just not catching on in the way that it needs to in order to fix the problem. We need a built-in solution. Gmail Lite should borrow the character restriction from Twitter and enforce it. 140 characters. But maybe bump it up to 160 characters, the actual SMS limit, as usernames wouldn’t be needed with this system. This way, messages could also be sent via SMS (again, like Facebook Messages). More importantly, messages would have to be brief. Even more brief than three sentences. It would be so beautiful. Part of the problem with email coming in is that when one comes in, you know in the back of your mind that you’ll have to type a bunch of words and hit send to respond to it. It will take time. So you put it off. If there was just this input box that forced you to be as brief as possible, I bet that a lot of people would respond more immediately. And the response rate in general would be higher. How do I know? I see it in my new Facebook Messages inbox and my Twitter Direct Message area. Obviously, this idea will have some people screaming bloddy murder. But remember, Gmail Lite would just be an opt-in option for users. And if you needed to send a long email, you could hop back into regular Gmail Classic with the click of a button. But I would bet that a huge percentage of Gmail users would opt-in to using Gmail Lite as their primary email solution. And it would come with some sort of built-in notifier in the mail itself (either at the bottom or in the metadata) to let people know that you were responding with Gmail Lite, and that’s why your response was so shot (like what three.sentenc.es does). It might be weird at first, but eventually, everyone would get used to it. So what’s stopping a startup from doing this? Why does it have to be Facebook or Google? Because, sadly, this is probably only going to work with a messaging system that has hundreds of millions of people already using it. (And of those, Gmail is in my mind still definitely the best.) Twitter has come the closest to doing this from the outside, but that service is used differently — it’s public messaging versus private messaging. And private Direct Messages are severely limited by the follow factor (someone has to be following you for you to DM them). Gmail’s Priority Inbox is great. But it really just dances around the true inbox problem. It helps you determine what email to ignore. It doesn’t solve the fundamental issue that we’re all seeing more and more as inboxes grow: the lame legacy formalities of the system. And the outdated ideas such as the subject line and even the send button. We need to kill all that stuff off. And we need a current email system to help do it, so it will actually catch on. Facebook Message may well be the future of this type of online communication for the younger generations, but Gmail has a chance to mimic the idea and get the rest of us involved right now. Gmail Lite. 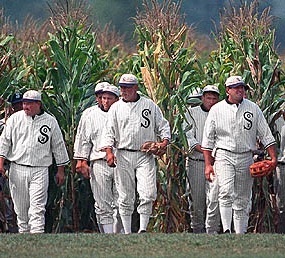 If you build it Google, we will come. Update: Chris Messina (who happens to work for Google) had some similar thoughts that he shared on his blog last week. 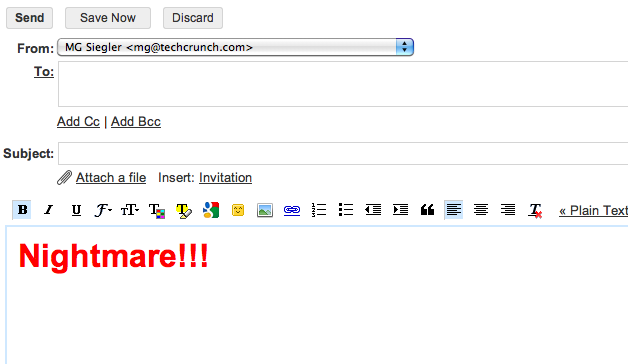 Check out his mock up for the simplified Gmail message, looks good.